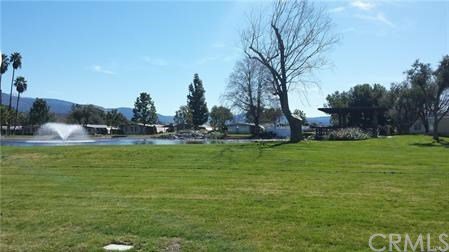 LOVELY HOME IN SOBOBA SPRINGS 55+ COMMUNITY. 3 BEDROOMS PLUS AN OFFICE! THIS BEAUTIFUL HOME IS SITUATED ON ONE OF THE LARGEST LOTS IN THE PARK! The front porch is great for relaxing and shaded for enjoying those quiet afternoons. Enter into the open living room with high vaulted ceilings and dark wood beams running across. The spacious living area has plenty of windows to make it a light, bright room. The home includes a formal dining area with built in hutch, indirect lighting and ceiling fan. The kitchen has plenty of cupboards and storage space. Indoor laundry room with more storage. Master bedroom has lots of space and a walk-in closet. Master bath has built in linen cabinets and huge tub/shower. Newer HVAC and water heater. Come enjoy the Pool, Spa, Clubhouse, Billiard room, Putting Green or walk along the lake and greenbelt areas. IT IS ACROSS THE STREET FROM THE NEW SOBOBA CASINO (you could walk or drive your golf cart!). The New Soboba Casino features a 5 star hotel and PGA championship golf course. Gorgeous view of the snow capped mountains! Call for your private showing today!